Uncapped Liverpool full-back Trent Alexander-Arnold has won a place in England's 2018 World Cup squad but, as expected, Joe Hart and Jack Wilshere failed to make the cut. Alexander-Arnold enjoyed a stunning breakthrough season with Liverpool and is in line to start when Jurgen Klopp's men face Real Madrid in next weekend's Champions League final. An ankle injury to club team-mate Joe Gomez appears to have worked in Alexander-Arnold's favour and he joins Tottenham right-back Kieran Trippier in the squad, with Manchester City's Kyle Walker now seemingly seen primarily as a right-sided centre-back by manager Gareth Southgate. Chelsea captain Gary Cahill is back in the fold but Hart's poor form during a season-long loan spell at West Ham has cost England's number one at their three previous major tournaments his place. Burnley's Nick Pope joins Jordan Pickford of Everton and Stoke City's Jack Butland among Southgate's goalkeeping options. Arsenal playmaker Wilshere largely put persistent injury woes behind him this season to make 38 club appearances in all competitions. However, a knee problem ruled him out of England's March friendlies against Netherlands and Italy and a final chance to impress Southgate, who plumped for Ruben Loftus-Cheek alongside his regular midfielders after the Chelsea youngster impressed on loan at Crystal Palace. Manchester City utility man Fabian Delph is set to win his first caps since 2015, having been one of the Premier League champions' surprise success stories of 2017-18, and is an option at left wing-back alongside Ashley Young and Danny Rose - the latter included despite making only 10 Premier League appearances for Tottenham this term. 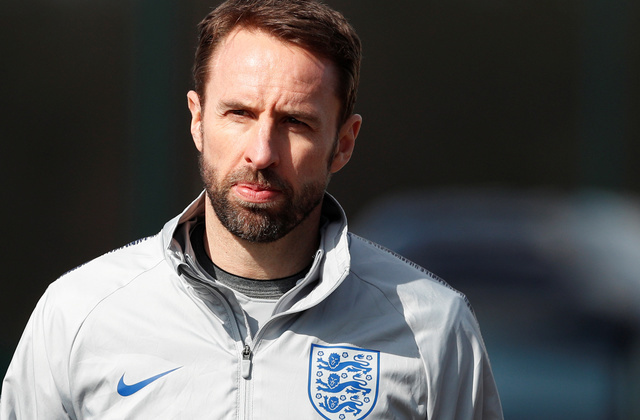 Tom Heaton, James Tarkowski, Lewis Cook, Jake Livermore and Adam Lallana have been named on Southgate's standby list. England will play pre-tournament friendlies against Nigeria and Costa Rica before kicking off their Russia 2018 bid against Tunisia on June 18. Panama and Belgium join them in Group G.
Jack Butland (Stoke City), Jordan Pickford (Everton), Nick Pope (Burnley); Trent Alexander-Arnold (Liverpool), Gary Cahill (Chelsea), Phil Jones (Manchester United), Harry Maguire (Leicester City), Danny Rose (Tottenham), John Stones (Everton), Kieran Trippier (Tottenham), Kyle Walker (Manchester City), Ashley Young (Manchester United); Dele Alli (Tottenham), Fabian Delph (Manchester City); Eric Dier (Tottenham), Jordan Henderson (Liverpool), Jesse Lingard (Manchester United), Ruben Loftus-Cheek (Chelsea); Harry Kane (Tottenham), Marcus Rashford (Manchester United), Raheem Sterling (Manchester City), Jamie Vardy (Leicester City), Danny Welbeck (Arsenal).